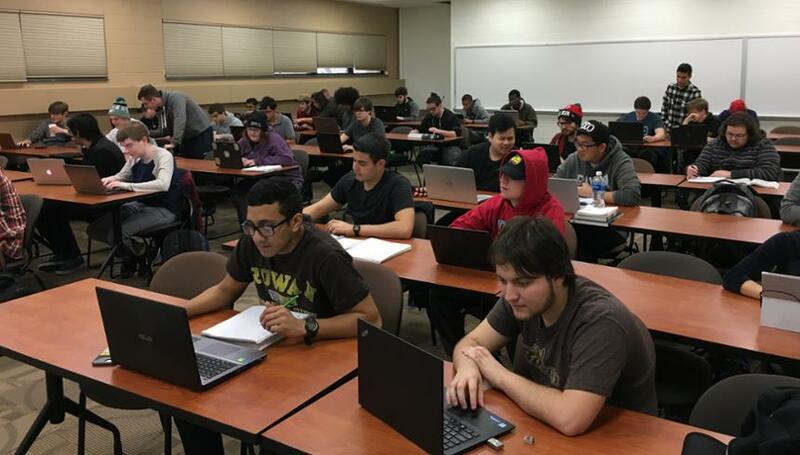 The Computer Science Learning Assistant (LA) Program is an innovative approach of integrating a student-centered interactive learning environment using Learning Assistants in the Rowan University Computer Science Department. Based on the successful LA models at the University of Colorado at Boulder and the University of Maryland, exceptional undergraduate CS students are recruited to engage in CS introductory courses focusing on student-centered learning. For more information on the CS Learning Assistant Program, please contact the Computer Science Department in Robinson #330. "Through the Fall ’17 semester, I had a CS Learning Assistant in my Honors Intro to Object Oriented Programming class. He has done an exceptional job helping students in the lab with his outstanding expertise. He never missed a class, has always been prepared and punctual, and when asked also provided feedback on the content of the assignments. He has proven to be an invaluable asset to the class, being instrumental in helping students better understand the material and completing the work in a timely manner. I look forward to having LAs in all my future semesters." "I used Learning Assistants for several semesters in Object Oriented Programming and Data Abstraction. The students felt that their mastery of material was enhanced by small, practice Active Learning exercises (facilitated by the LAs). Even more value was obtained by using LAs to spend quality time with students in reviewing their lab submissions. Instead of just receiving feedback at grading time, the students were able to have their code reviewed by LAs who took the opportunity to explain issues in the code or to suggest more elegant alternatives. The students definitely benefited from such exposure." "As an LA and tutor, I learned valuable skills that were useful throughout my college experience and early career. Among the many things, I learned how to communicate my thoughts and ideas efficiently and effectively in the classroom, to group members, and while helping others. This skill transferred well in my internship and workplace, as I found myself able to communicate on the same level as some of the more seasoned software engineers. I would recommend being an LA for the leadership skills gained and the important skill of knowing how to decipher someone else's code. These are just some of the core skills I developed from the program. Being an LA or tutor can definitely help you learn to adapt to new situations, learn problem-solving skills, and also get you out of your shell." "I appreciated the review of old material that serving as an LA has provided. I also enjoyed meeting all the underclassmen in the department and helping them succeed. The soft skills (communication, understanding others, quickly adjusting strategies) that I learned will also be very beneficial to me in the future." "Being an LA-Tutor has been an amazing experience for me. I have loved sharing my passion for computer science by helping fellow students grasp this complex area of study. In turn, I have also solidified my knowledge of these certain subjects even more. Working as an LA-Tutor was a great source of networking at Rowan. It was also a great opportunity to further my interpersonal skills. I received an internship at Lockheed Martin RMS in Moorestown and plan to continue working there after graduation." " 'To teach something, you must understand it on an entirely different level.' These words are incredibly true when I look back at being a Computer Science LA. I was an LA for Professor Chien's IOOP course for two years, where I guided students thinking during lab assignments and answered students' questions during my hours in the tutoring room. One benefit of LA-ing for this time was a more solid understanding of the course material in the Rowan CS curriculum. In an environment where you learn topics in class and study for the final, you might forget about some of the course material even just a semester later. LA-ing an IOOP course allowed me the opportunity to revisit my fundamentals as I helped new students build theirs, and tutoring courses such as OOPDA, DSA, and Discrete Structures reminded me of many topics that would then be needed in the upper level courses I was taking at the same time. Being an LA also greatly improved on my communication skills for teaching. For one, being an LA let me interact with a large variety of students as they approached the same problem set. Figuring out the best questions to get each individual student thinking (without giving away the answer!) was an exercise that taught me how to step back and explain concepts from a different perspective. On the other side of the river, I was also able to see how my professor, Professor Chien, talked to students during class in a way that helped them better understand the course material. By learning from both practice and the experience of my professor, I was able to greatly hone my ability to communicate with students. In fact, another pleasant benefit of LA-ing was the students themselves! During labs and tutoring hours, I was able to meet and get to know a lot of unique and very interesting students as an LA. The creativity and incredible work ethics of some of these students has inspired me to work harder at my own work, time and time again. Some of the students I met during LA-ing have now grown into leadership positions at campus organizations like ACM-W or become tutors and LAs themselves, and its a really cool experience to see them catching up to me  ! After LA-ing, I've had internships in academic research at Harvey Mudd College, as well as professional software engineering at Amazon Web Services. In both environments, all of the skills I learned and experience I gained from LA-ing at Rowan allowed me to do my best work, and walk away satisfied with my accomplishments at each step. As a software engineer with greater communication skills, CS fundamentals, and a larger network of friendly faces to see here at Rowan, I want to say thanks to Professor Chien and the LA program! For any potential LAs out there, the two things I have to say to you are 1. DO IT! and 2. Always reach out for guidance. LA-ing not only gives the students a resource in you, but gives you abundant resources in your professor and the tutoring community! " "Working for the computer science department as a learning assistant and tutor has been a great experience for me. I have grown to really enjoy teaching and helping others understand programming better, and seeing my peers get more interested in the subject and grow as programmers because of me is very rewarding. Not only does teaching help me improve my mastery of the subject, it gives back to this amazing department and provides help to those who need it. Helping someone get through a difficult topic and seeing the stress disappear before my eyes can be the highlight of my day. " "My experience as a tutor and LA has been the most rewarding aspect of my college career. I decided to tutor and LA because I was in search of ways to build my resume and set myself apart from other students. Not only were these positions resume builders, but they also offered me the chance to make a difference. I was motivated to maintain a clear understanding of everything I had learned throughout the Computer Science curriculum in order to ensure that I would be able to effectively help others. I quickly learned that teaching others was a fantastic way to increase one's own understanding of a subject. The 'aha' moments of my peers when I helped them understand concepts they struggled with gave me a great sense of gratification. My only recommendation is that more tutors should be hired to ensure that there are at least two tutors in the tutoring room at any given time. I would often struggle to give every student my attention on days when many students would come in during my shift. Other than that, I believe these are great programs and I would recommend these positions to anyone looking to enrich their college experience by helping others while reaping a wealth of benefits. Serving as an LA has also led me to a summer internship at Leidos working on air traffic control systems at the FAA Technical Center as well as the opportunity to work part-time during my last semester at Rowan." "I really enjoyed being a tutor and a learning assistant because it allowed me to meet more people at Rowan and within the CS department; being a commuter I did not really have opportunities to interact with other students. Explaining things to students helped me grasp the CS ideas and concepts more clearly. Some students ask very interesting questions causing me to think about programming in ways I had not before. If I could LA again, I would like to try classes other than IOOP. I think DSA would be fun because of the subjects and could help me better understand algorithms."